Acerola is a shrub or small tree that bears a delicious cherry-like fruit. This is why Acerola is sometimes known by the term “acerola cherry”, rather than just acerola. 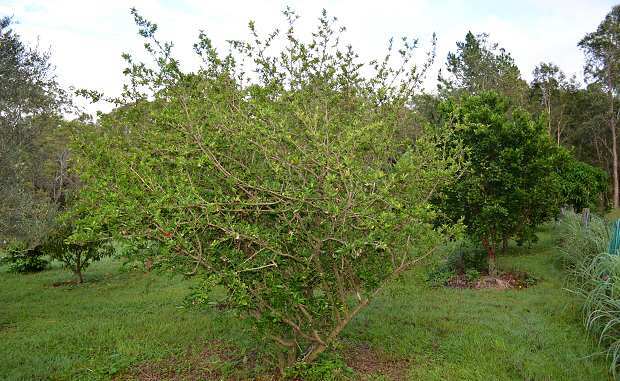 Some other common names include Barbados cherry and West Indian myrtle, but the scientific designation of this tropical fruit is Malpighia emarginata. Native to Mexico, South America, and Central America, this fruit has been prized for thousands of years by various indigenous cultures. It is now widely exported throughout the world and is also cultivated in certain parts of the Indian subcontinent, as well as southern areas of the United States. In terms of culinary applications, acerola cherries have a distinct flavor and are eaten in much the same way as regular cherries, although they aren’t related: either raw, or in baked goods, sweets, ice creams, jellies, jams, and of course in frozen juice concentrates for use in smoothies. We buy our acerola from a specialist supplier who sources the acerola berries direct from South America. The juices are picked, pulped and frozen before being shipped to the UK, ensuring that all the goodness remains locked into the product right up until it is blitzed into a smoothie in one of our shops. At the time of writing this blog we are using Acerola in one of our Pulp Explosion juices. Blitzed with freshly squeezed apples the acerola provides a tasty refreshing smoothie packed full of Vitamin C.
In July 2008, Absolut Vodka announced its second product in a limited-edition series, Absolut Los Angeles, with acerola used as one of a combination of four flavors for the spirit. Açai, pomegranate and blueberry are also used. Acerola flavour is also used in Tic Tac sweets. The real benefit of acerola, comes from the rich mixture of nutrients and vitamins contained in the fruit, in addition to a wealth of antioxidants and one of the highest concentrations of vitamin C in any fruit. Diabetes Management: Recent research has shown that the antioxidants found in acerola cherries can actually help to slow the release of sugar into the bloodstream. This regulation of insulin and glucose is a crucial means of preventing diabetic spikes and drops, which can be dangerous (or even deadly) for people suffering from diabetes. Acerola cherries not only help to prevent the onset of the condition as well but also regulate the blood sugar level in healthy individuals. Immune System: Acerola cherries have one of the highest contents of vitamin C, topped only by camu camu. For people who want a quick boost to their immune system, pop some acerola cherries into your weekly diet and see how much better you’ll feel! Vitamin C stimulates the production of white blood cells, which are the body’s primary line of defense against foreign agents and pathogens. Furthermore, vitamin C is a crucial component of collagen, which means that your body can heal itself faster with repairing cells, blood vessels, organs, and tissues from illness or injury. Metabolic Issues: To keep your body running at a normal pace, you need to regulate your metabolism. One of the most important groups of vitamins which help to do that is the vitamin B family. These vitamins, including niacin, riboflavin, and folic acid, help to regulate your hormonal and metabolic processes to ensure that your body runs smoothly. 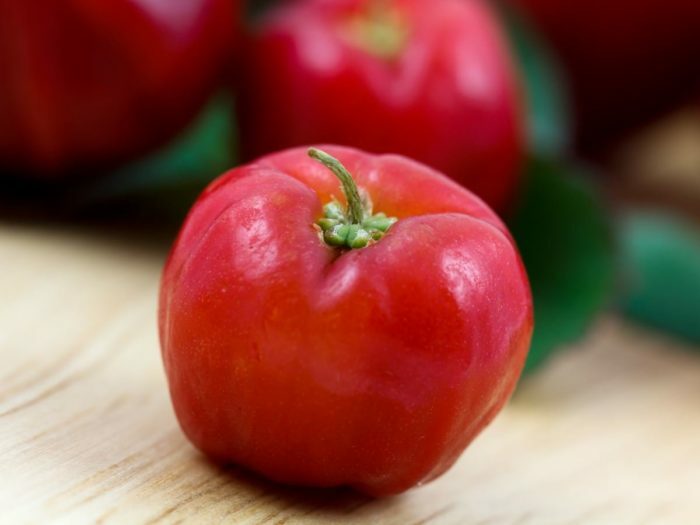 Digestion: Although acerola cherries don’t have as much fiber as many other fruits, it is still significant and can definitely help boost your digestive health. Dietary fiber promotes smooth passage of food through the gastrointestinal tract, which relieves constipation, bloating, diarrhea, cramping, and more serious issues like gastric ulcers. Furthermore, dietary fiber even helps clear out the dangerous cholesterol from the heart. Caution: Some people have reported adverse reactions to eating acerola cherries, including upset stomachs, sleeplessness, and insomnia. Too many acerola cherries can also cause diarrhea. The high levels of vitamin C can be dangerous if you suffer from gout, as it can boost levels of uric acid. Other than that, acerola cherries are not commonly known as an allergenic food. As with all similar claims, please conduct your own research. The source of the article provides references to all claims. The views and nutritional advice expressed in this article are not intended to be a substitute for conventional medicine. If you have a medical condition or health concern, see your doctor, before taking any health supplement.